Donate comic books from the Platinum Age, Golden Age, Silver Age, Bronze Age, or Modern Age to charity and take back some closet space! 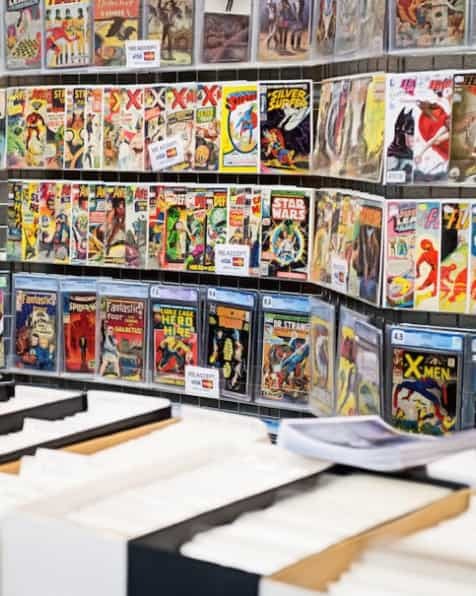 The tax deduction rewards far outweigh having to sell the Comic book collection yourself, and the proceeds benefit families in need across america. Donate comics from all of your favourite superheroes like Spider-man, Batman, Captain America, Fantastic Four or Spawn today! Attempting to sell comic books or whole comic book collections yourself generally leads to alot of wasted time and sometimes a big financial loss. When you donate comic books with Collectibles with Causes, we make sure the whole procedure is fast and simple and that the tax write-off is financially favorable. In regards to collecting, comic books are incredibly common. Just examine the total amount of comic book shops which are dedicated solely to this collecting craze. If you collect comic books, then you probably have books that are worth some money individually. Combined together though, your comic book collection may be worth plenty more, money which may be utilized to help relieve some of the country's most pressing issues. Along with making a difference, your comic book donation will benefit you at tax time. This is because all contributions made to Collectibles with Causes are assigned a fair market value that can be deducted from your taxes as a charitable gift. It doesn't matter if you only want to part with a couple comics or with your whole collection. Any comic donation, big or small, is greatly valued. Please complete the form below or call toll free to donate comic books today!